The ever-changing financial world we live in today can feel confusing and uncertain, especially when compounded by wealth. You’ve worked your entire career building confidence to retire, and should never feel unsure in the final steps. 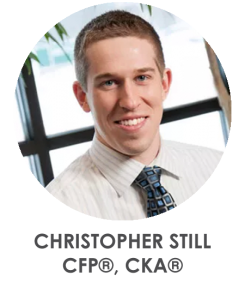 Chris Still specializes in helping clients clarify even the most complex financial situations, with expertise in tax strategies, investment management, retirement planning, and wealth transfer. Bringing a world-class service mindset to client interactions, Chris will help you plan for your investments to last for years to come. Chris and his wife Sarah are both from West Michigan and are proud to now raise their family here as well. They can often be found exploring West Michigan, experiencing locally-owned restaurants, and spending time with family. Chris and Sarah are active in their church where they coordinate a class on personal finance.